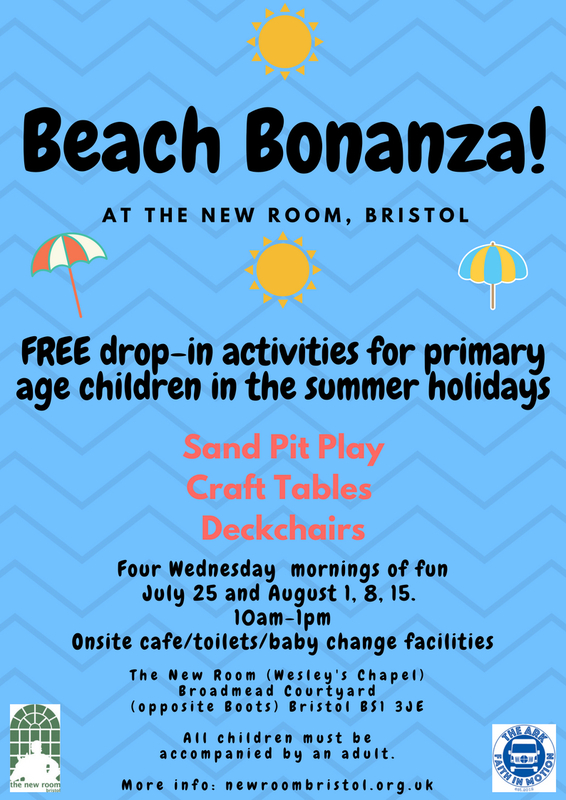 Come along to the New Room’s Broadmead Courtyard this summer for a real summer beach bonanza! Along with members of the Ark Bus team, we’ll be turning part of the courtyard into an drop in summer activity centre. There’ll be a sand pit, holiday-themed craft tables and a treasure hunt. Deckchairs and a gazebo will be available for sunbathing and relaxation and our on-site café will be selling coffee and cake. On the courtyard wall, we’ll be sharing some thoughts about plastic use and how that affects the sea. We’re going to use reclaimed and recycled materials as much as possible in our craft activities. Make a fish and put it on the wall to add to our shoal. Beach Bonanza is running on four Wednesday mornings – July 25, then August 1, 8 and 15, from 10am-1pm. Onsite facilities include a café, toilets and baby change facilities. Find us at The New Room (John Wesley’s Chapel) – Broadmead Courtyard is opposite Boots.